All transactions are safe and secure with a reliable history in online purchasing behind each of our associates. Buy the Effie Trinket shirt to own Hunger Games clothing and merchandise. Effie Trinket lives in the Capitol and works as an adviser who is assigned to District 12. Not only does she draw the names of the tributes at the reaping, she escorts the tributes to the Capitol and assists them in proper etiquette, etc. At first she is unhappy that she was assigned to the poorest district, but as she gets to know the tributes her feelings change. 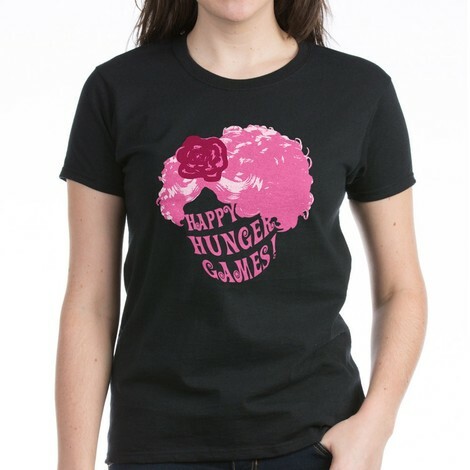 Her most notable quote is perfect to utter while wearing this Effie Trinket t-shirt, "Happy Hunger Games! And may the odds be ever in your favor!" In addition to the Effie Trinket tee above, browse the Hunger Games Clothing Gallery for more apparel like men's and women's clothes, kids shirts or hoodies.